You know you want a cool looking dorm room that is unique from everyone else's on your dorm floor. To have one of a kind dorm essentials in your dorm room decor, you need to think outside the box a little bit. What's funny about this dorm necessities item is that you don't have to think outside of the box too much! This college supplies item is a basic college poster that will make your college wall decor one of a kind. Our London Phoneboxes Dorm Door Poster turns a basic dorm poster into dorm wall art and has a unique look that will make your dorm room decor pop with style and color. Our London Phoneboxes College Door Poster features a rainbow of London Phoneboxes against a black and white backdrop of buildings. 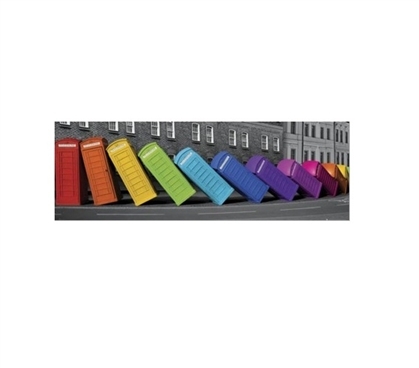 The black and white backdrop makes the rainbow colors in the London Phoneboxes really pop! The phoneboxes in this dorm item are stacked artfully in a domino effect for a really cool looking addition to college wall decor. This college poster is also oversized so you can center a large dorm item like your dorm bed right underneath this cool dorm poster. Make your dorm room decorations pop with style and fun color while adding artistic dorm wall art to your college dorm room with our London Phoneboxes College Door Poster!